Though Lew dedicates most of his time to doing and thinking about science, he is also an avid reader. In particular, he enjoys science fiction, mystery, and history books. Research in Lew’s lab investigates signal transduction. He has spent most of his career trying to improve our understanding of cell signaling pathways at a molecular level since many diseases involve defects in signaling. In cancer, for example, cells are constantly getting signals to continue growing and dividing, even though this is detrimental to the organism. Lew feels like he was a born scientist. As a child, he was incredibly inquisitive, and he loved asking his father questions about how the world worked. His father was worked in the Coast Guard during World War II and was very knowledgeable about navigation and weather. Lew’s questions were often met with detailed scientific explanations that further piqued his interest in science. Chemistry was especially interesting for Lew, and he remembers mixing the contents of his chemistry kit together and marveling as the reactions changed color and the ingredients changed form. He also admits to using his early chemistry knowledge to dabble in making his own rockets and firecrackers as a kid. 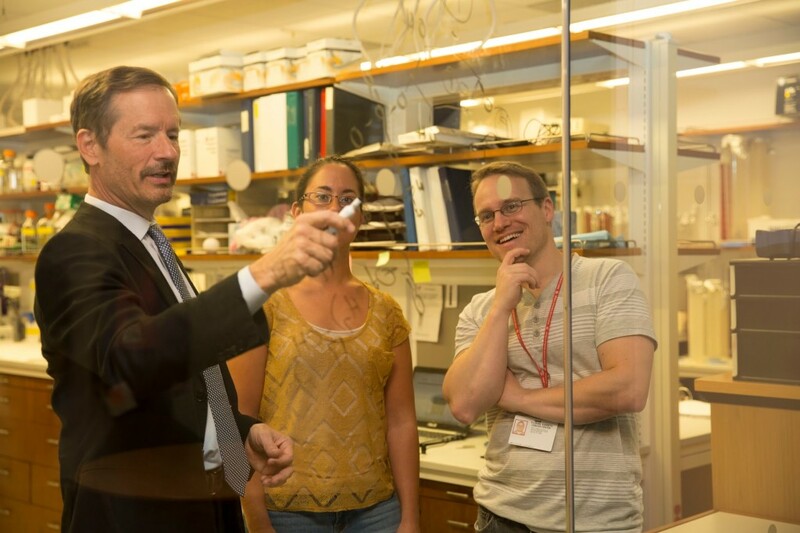 When Lew and his colleagues first published their findings on the existence of a new enzyme that interacted with cancer-related proteins (PI3K), other labs tried to replicate their work and could not get the same results. These other labs altered the methods of the experiments using detergents to break up lipids, rather than using sonication to form a more membrane-like environment. Lew knew that this was the reason for the contradictory results, but it took years to convince the other scientists in his field. During this time, several papers were published refuting his findings, and he was denied tenure at Harvard University where he was working. Despite challenges surrounding the initial discovery of PI3K, this was Lew’s biggest success. One thing that made this discovery particularly exciting was that it stemmed from an unexpected observation. He and his lab were running an unknown protein on a chromatography plate alongside a similar known protein that they suspected would match. They noticed a systematic 1 millimeter difference in the positions of where these two proteins migrated. It was very subtle, but they had identified a completely different protein. One of the most memorable travel experiences for Lew was a trip to india to attend a scientific meeting on cancer. The meeting was held in Agra, and he took a bus from the airport in New Delhi to Agra, and was in awe of all the different modes of transportation on the road. There was everything from carts to camels, all packed together and using the same road. Lew was enchanted by the beauty of monuments like the Taj Mahal and Agra Fort that he was able to visit. The location, and the scientific meeting were fantastic. It is a tradition in Lew’s lab to get the group together for lab retreats. He invites the current students and post docs, as well as previous members of the lab for three days packed with presentations, great food, music, and dancing into the early hours of the morning. Do whatever easy for you because the things that are easiest are what you are talented at. Follow your talent. Lewis has made significant advances in cancer research stemming from his discovery in 1984 of the signaling pathway phosphoinositide 3-kinase (PI3K) which has a critical role in oncogene-mediated cell transformation, as well as insulin-dependent stimulation of glucose uptake and metabolism. Further work revealed that lipid products of PI3K directly activate the AKT/PKB protein kinase to provide a cell survival signal via increasing uptake of glucose. Activating mutations in PI3K genes have been implicated in many cancers, along with inactivating mutations in the PTEN gene (encoding a phosphatase that degrades PI3K lipid products). These discoveries have stimulated pharmaceutical companies to develop PI3K pathway inhibitors for cancer therapy. Lewis and his colleagues are currently testing the effects of combining PI3K inhibitors with emerging drugs as potential new ways to attack BRCA1 cancers, including the difficult-to-treat triple-negative breast cancer and ovarian cancer. Recent studies from the Cantley lab have revealed that growth factors, through activation of PI3K and other signaling pathways, cause major changes in cellular metabolism that are critical for the growth of cancer cells. Ongoing studies are defining how oncogene transformation of cells alters the flux of metabolites such as glucose and glutamine. The Cantley lab employs a wide range of techniques in its investigation of cancer metabolism and phosphoinositide signaling. The author of more than 400 papers and 50 book chapters, Dr. Cantley has received several prestigious accolades, including membership in the American Academy of Arts and Sciences, the National Academy of Sciences and the Institute of Medicine of the National Academies.